CM Magazine:Sir John S.D. Thompson: The Pushover Who Died Too Soon. (Canadian Prime Ministers: Warts & All). Sir John S.D. Thompson: The Pushover Who Died Too Soon. (Canadian Prime Ministers: Warts & All). Elle Andra-Warner. Illustrated by Suzanne Mogensen. Toronto, ON: JackFruit Press, 2007. Thompson, John S. D. (John Sparrow David), Sir, 1844-1894-Juvenile literature. Nova Scotia-Politics and government-1867-1896-Juvenile literature. Sir Charles Tupper: The Bully Who Battled for Canada. (Canadian Prime Ministers: Warts & All). Johanna Bertin. Illustrated by Gabriel Morrissette & Bernie Mireault. 55 pp., pbk., $19.95. ISBN 978-0-9736406-7-0. 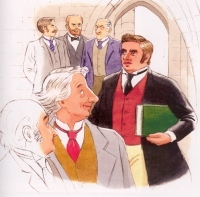 Tupper, Charles, Sir, 1821-1915-Juvenile literature. Nova Scotia-Politics and government-19th century-Juvenile literature. Part of the 22-volume Warts & All series about Canadian Prime Ministers, these titles showcase the lives of two men who lived during the time of Confederation. 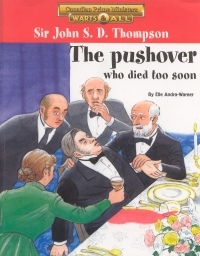 The first title features Sir John S.D. Thompson, referred to as a pushover because he was cajoled into taking various positions rather than wanting them himself. Born in Halifax, Thompson became responsible for the sole support of his family at a young age. He supplemented his lawyer's income with his job as a shorthand reporter for the government and later went on to become an alderman on Halifax city council, the Premier of Nova Scotia, a Nova Scotia Supreme Court judge, a cabinet minister (Minister of Justice) and, finally, Prime Minister at age 48. For much of his political life, he was separated by distance from his wife and family, and this separation took a toll on his health. He and his wife wrote daily letters to one another, and, though she missed him terribly, she encouraged him to stay in politics. Knighted by Queen Victoria, Thompson served as Prime Minister for only two years. Overweight as a result of poor eating habits and ill with both Bright's disease and heart disease, Thompson collapsed at a luncheon at Windsor Castle and died instantly from a massive heart attack in 1894. Over the years, his wife had saved over 30 trunks of his papers which were eventually donated to what is now Library and Archives Canada, thereby providing a lasting legacy of Thompson's achievements. His contributions to Canada were many: he negotiated fishing treaties between Canada and the U.S., co-founded Dalhousie Law School, drafted and developed the Canadian Criminal Code, campaigned for equal rights for men and women, promoted bilingualism and was responsible for initiating Labour Day. Sir Charles Tupper was Canada's sixth Prime Minister, serving in this position for less than 10 weeks after a distinguished 41-year career in politics. He had been a country doctor, staff surgeon and Chief Medical Officer, and a clever businessman before becoming Premier of Nova Scotia. Known for his strong personality and his assertiveness, Tupper was also considered to be a ruthless bully by many of his contemporaries. 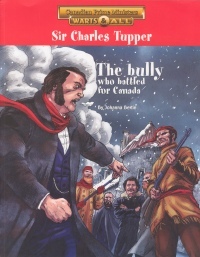 In Sir Charles Tupper: The Bully Who Battled for Canada, readers will learn about Tupper's personal life which was often marred by tragedy- he took the deaths of two of his children especially hard, because, as a medical doctor, he felt he should have been able to save them, and his home was destroyed by fire. Perhaps the deaths of his daughters made him more protective of his surviving children, and when his newly married daughter was living in the Red River area during the time of the Métis uprising, Tupper travelled across the country by train, stagecoach, horse-drawn sled, dogsled and on foot in order to get her, only to find that she was quite comfortable and wondered what the fuss was about. In 1896, when seven members of Prime Minister Bowell's cabinet resigned, the PM resigned as well, and Tupper was appointed Prime Minister. As the previous government had been in power for five years, Tupper felt compelled to call an election. Because the people of Canada wanted change, they elected Liberal Wilfrid Laurier, depriving Tupper of a chance to prove himself as PM. He had served in that capacity for only 68 days. Tupper retired from politics after he lost his seat in his riding in 1900 and moved back to England. A devoted husband for over 66 years, he returned to Canada in 1912 when his wife died so that she could be buried on Canadian soil. He then took a cross-country train ride to visit all of the places that held happy memories for him and returned to England in 1913. Tupper died at the age of 94 in 1915. His legacies include the Free School Act which gave all children in Nova Scotia free education paid for by taxes, improved schools, and the National Policy which protected Canadian manufacturers from unfair trade with the United States. He also defended Maritime fishermen and promoted the completion of the Canadian Pacific Railway, western immigration, the development and protection of Canada's vast resources and improved health care. Other accomplishments include working with Sir John A. Macdonald and others to bring about Confederation and the combining of five different tariffs, currencies and postal systems into one. The writing styles of both authors are in keeping with the other volumes in this series. They are fluent, engaging and, for the most part, unbiased (although in the title about Sir John S. D. Thompson, author Elle Andra-Warner states, when referring to Americans' view of Canadians, Often they see us as preachy and smug, not nearly conservative enough, and they believe we think we're smarter than them. ) Words printed in boldface type appear in an extensive glossary. There is also a table of contents, a timeline of important dates and events which occurred during the featured Prime Minister's lifetime, an index and a list of suggested books, web sites and places to visit in Canada for further study. Also included are several pages of Hot Topics, a few examples being the Criminal Code's protection of young offenders and medical practices of the 1800s. Illustrations consist primarily of drawings and paintings although there are a few archival photographs as well. (Here again, the various illustrators whose work graces the pages of the series' titles have somewhat similar styles so that the series has a uniform appearance.) 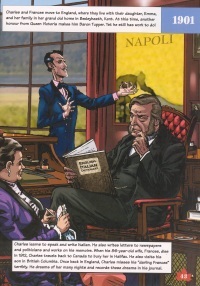 A cartoon beaver character appears in each of the volumes in the series, providing additional facts, while coloured bands and sidebars in each chapter serve as time lines of the events covered. The main strength of the books in the series is their ability to showcase not only the Prime Ministers' wonderful contributions to this country, but also their weaknesses as leaders and human beings, making them more human and appealing to the reader. These titles would be welcome additions to any school or public library. NEXT REVIEW | TABLE OF CONTENTS FOR THIS ISSUE- December 19, 2008.